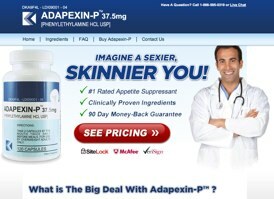 Adapexin-P is yet another phentermine alternative that claims to be a miracle weight loss pill without the harmful side-effects that comes with ingesting phentermine, but works exactly like it. It is a non-prescription pill which can be readily bought online. And like many other phentermine alternatives there are mixed reactions to it. Though manufacturers have claimed Adapexin-P to be one of the safest in the market and best rated diet pill 3 years in a row, user reports say otherwise. The ‘clinically proven’ ingredients cause some serious reactions and the strong appetite suppressant actually leaves users feeling hungry and very restless as a result. According to the official website, Adapexin-P is made up of clinically proven ingredients which guarantee extreme weight loss results. In fact there is a 90 Day Money Back Guarantee because the manufactures are so confident of the results. A very hopeful beginning but let’s see how it actually works. 8 powerful ingredients come together to suppress appetite and thereby reduce caloric intake, burns fat faster and creates a caloric deficit which results in shedding of an amazing amount of weight in a matter of just a few days. Though some of the ingredients are proven and used in many other diet pills, the exact blend in Adapexin-P is not tested or backed up any clinical trials. The official website has a lot of sales jargons but no useful information when it comes to details of product or easy ways to contact them in case of problems. The address given raises a big red flag – it is said to be based in Utah which is the diet pill scam capital. That, along with bad reviews and reports of harmful side-effects, makes it a questionable supplement option. The diuretic and stimulant qualities of caffeine may lead to upset stomach and indigestion, frequent urination and diarrhea, headaches and insomnia, jitters, anxiety, restlessness and increase heart rate. Phenylethylamine may lead to heart burn, dizziness, mental confusion, nausea, insomnia, constipation and mild or intense headaches. Severe side-effects include sharp pain or tightness in chest, breathing difficulty, hypertension of irregular heartbeat. It may also lead to allergic reactions like rashes or hives, irritation and swelling of the neck, face, lips and tongue. It also has the potential to react with levodopa and antipsychotic medications leading to tardive dyskinesia. Synephrine can have serious cardiovascular and gastrointestinal side effects. Chromium leads to severe mood changes, anemia, hemolysis, thrombocytopenia, hepatic dysfunction and as well as possibility of weight gains. Extreme cases have also reported renal failure along with cognitive and motor dysfunction. If unchecked these could cause long-term damage to the body. Available from its own official website. Buying in store from Australia (pharmacies and health supplement stockist) are non existent. 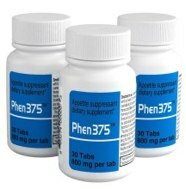 Phen375 is highly recommended and a top selling diet pill in the US, the UK, and several European countries. Phen375 is a legal Phentermine concept that is available to buy direct without a prescription. There are so many user testimonials and real life success stories that the manufacturers do not need to go down the celebrity endorsement route.